For a five-part introduction to AngularJS, check out ng-okevin’s Angular. 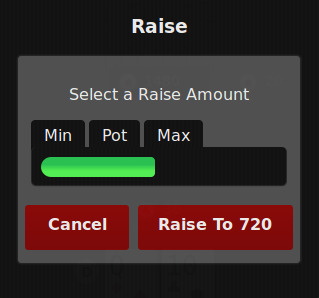 I ditched jQuery Mobile’s sliders for my growing AngularJS poker app. It had served as the app’s poker bet slider. All I wanted was a simple slider widget from jQuery Mobile, but the UI framework wanted me to marry it in return. It had its way with my HTML markup, littering my DOM elements with selfish classes and attributes, like an open garbage truck on the freeway. My CSS rules felt oppressed like liberal college students as jQuery Mobile’s CSS files applied forceful rules my top-level html and body elements. The kicker? The slider quickly became deprecated, not working on newer versions of Firefox. Never even saw it work on Chrome. My disappointment digresses. The point is: I assembled my own customizable mobile slider that hooked into AngularJS in the form of a directive. Let us begin with the HTML, which AngularJS enhances with declarative two-way bindings. Directives teach HTML new tricks, allowing us to write reusable components and widgets. The link function allows us to register event handlers and watches on the scope, all binded to our template. link supplies the AngularJS scope, the element acting as the directive template, and attributes of the element. Let us get some initialization out of the way. This just allows us to determine whether the user is currently dragging the slider with a click or touch. Whenever the user drags the slider, we want to update its binded scope value. Vice-versa, whenever the binded scope value changes, we want to visually update the slider’s fill. // Throttle function to 1 call per 25ms for performance. // Don't drag the slider on mousemove hover, only on click-n-drag. Above is the math driving the slider. We want to calculate how far the slider is dragged relative to the max value of the slider, in terms of a percentage. We then take that percentage of the max value to attain the slider’s value. That value is then applied to the scope. // Allow dragging past the limits of the slider, but impose min/max values. // Set the value to percentage of slider filled against a max value. // Let all the watchers know we have updated the slider value. We have enough to calculate the slider’s value. We set the width of the inner span to create the visual effect of the slider, and update the scope’s slider value. This accomplishes one-way data binding; if we change the slider, we change the slider’s value in the scope. But we also need to account for if the slider’s value in the scope is changed somewhere else, we need to visually update the slider. We accomplish this by registering a watcher on the scope. When the slider’s value in the scope is updated somewhere else, the watcher will trigger our callback function. We change the slider’s fill percentage to respectively match the new slider value. Setting the width of the inner span changes the fill of the slider. To view the code, inspect the code for this page as I inlined it in the HTML. By now you might have started on your own sweet AngularJS app. But testing is an important part of development. How to test such an opinionated framework? Check out my post on Mock Unit Testing AngularJS Services with Karma and Jasmine.